We had already seen the vaibhavams and an intro for kaliyan aruL pAdu .It can be viewed at kaliyan aruL pAdu. We will start with the mUlam and the translation of kaliyan aruL pAdu below. 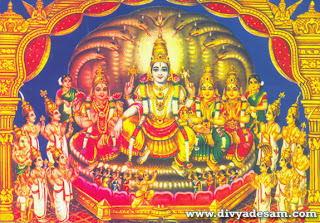 is the divine spouse of srI, ie. mahAlakshmi. emperumAn is always referred as the husband of thAyar even though he can be referred in many ways. When He was having all the world in his stomach during praLaya kAla, mArkandEya maharishi asked who the child was, the child showed his chest and mArkandEya maharishi found out that He was srIya: pathi. It is evident from this that emperumAn himself identifies Him as thirumAl. Even pEyazhwar starts his prabandham as ‘ thirukkandEn’ when he sees emperumAn. So emperumAn is always referred along with thAyar. emperumAn has all his desires fulfilled. He has’nt got any unfulfilled desire. This is because his nithyavAsam is paramapadham, nalam andham illadhOr nAdu (No end for happiness). perumAl has His nityavAsam at paramapadham. It is not reachable by anyone but it is a place where even brahma and sankarA are eager to go. 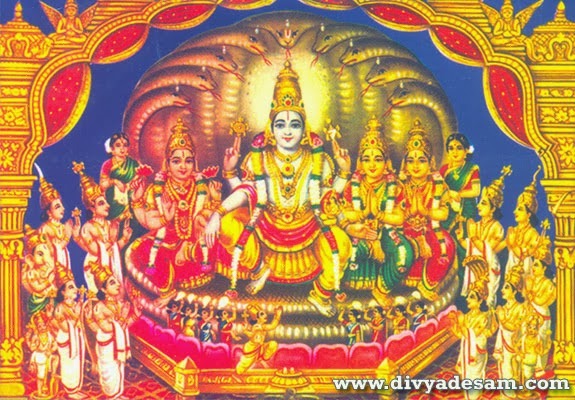 Brahma says “ya: na devA : na munaya: na chAham na cha sankara: jAnanthi paramEshasya thadvishno: paramampadham”. emperumAn is the residing place for all kalyAna gunAs. emperumAnAr in his saranAgathi gadyam says ‘akhila heya pratyanIka kalyANaikatAna!’. Here ‘kalyANa aikatAna’ means the sole abode of and completely full of, all kinds of virtues. In another curnikai he says the different kalyAna gunAs of emperumAn. This saranAgati gadyam passage is very important one since it deals with the main bhagavat gunams which are JnAna, bala, aiSvarya, vIrya, Sakti, tejas,sausilyam, vAtsalyam, mArdavam, Arjavam, sauhArdam, sAmyam, kAruNyam, mAdhuryam, gAmbhIryam, oudAryam, cAturyam and sthairyam. Emperuman is complete with all the kalyana gunas. bhagavAn is stated as ‘paripoornNanaayirukkiRa sarveshvaran’. The thamizh equivalent for this is ‘nambi’. Nammazhwar also says ‘nambiyai then kurungudi ninra’. Thus emperumAn is described in the first few lines. We will continue in the next post. good effort. pl. try to give the translation in tamil also. adiyEn will try to do so.